The lecture is much maligned. An ancient art form, practiced for centuries by university lecturers, writers and public figures, it is now widely-regarded as an inferior mode of education. Lectures are one-sided, information dumps. They are more about the ego of the lecturer than the experience of the audience. They are often dull, boring, lacking in dynamism. They need to be replaced by ‘flipped’ classrooms, small-group activities, and student-led peer instruction. And yet lectures are persistent. In an era of mass higher education, there is little other choice. An academic with teaching duties simply must learn to lecture to large groups of (apathetic) students. The much-celebrated paradigm of the Oxbridge-style tutorial, whatever its virtues may be, is simply too-costly to realise on a mass scale. 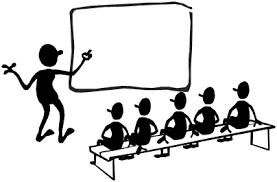 So how can we do a better job lecturing? How can we turn the lecture into a useful educational tool? I claim no special insight. I have been lecturing for years and I’m not sure I am any good at it. There are times when I think it goes well. I feel as if I got across the point I wanted to get across. I feel as if the students understood and engaged with what I was trying to say. Many times the evaluations I receive from them are encouraging. But these evaluations are global not local in nature: they assess the course as a whole, not particular lectures. Furthermore, I’m not sure that one-time, snapshot evaluations of this nature are all that useful. Not only is there a significant non-response rate, there is also the fact that the value of the particular lecture may take time to materialise. When I think back to my own college days, I remember few, if any, of the lectures I attended. It’s the odd one or two that have stuck in mind and proven useful. It would have been impossible for me to know this at the time. So the sad reality is that most of the time we lecture in the dark. We try our best (or not) and never know for sure whether we are doing an effective job. The only measures we have are transient and immediate: how did I (qua lecturer) act in the moment? Was I fluent in my exposition? Did the class engage with what I was saying? Did they ask questions? Was their curiosity piqued? Did any of the students come up to me afterwards to ask more questions about the topic? Did I create a positive atmosphere in the class? Despite this somewhat pessimistic perspective, I think there are things that a lecturer can do to improve the lecturing experience, both for themselves and for their students. To this end, I created a poster with four main tips on how to lecture more effectively. I created this some time ago, after reading James Lang’s useful book On Course: A Week-by-Week Guide to Your First Semester of College Teaching, and by reflecting on my own classroom experiences. You can view the poster below; I elaborate on its contents in what follows. The first thing to do in order to improve the lecturing experience is simply to improve one’s own attitude towards it. If you read books on pedagogy or attend classes on teaching in higher education, you’ll come across a lot of anti-lecture writings. And if you do enough lectures yourself, you can end up feeling pretty jaded and cynical. The main critique of the lecture as a pedagogical tool is that it is antiquated. It may have had value at a time when students didn’t have easy access to the information being presented by the lecturer, but in today’s information rich society it makes no sense. Students can acquire all the information that is presented to them in the lecture through their own efforts — all the more so if you are providing them with class notes and lecture slides. So why bother? The answer is that the lecture is still valuable and it’s important to appreciate its value before you start lecturing. For starters, I would argue that in today’s information-rich society, the lecture possibly has more value than ever before. The lecture is not just an information-dump; it is a lived experience. Just because student’s have easy access to the information contained within your lecture doesn’t mean they will actually access it. Most probably won’t, not unless they are cramming for their final exams. Not only is today’s society information-rich; it is also distraction-rich. When students leave the classroom they will have to exert exceptional willpower in order to avoid those distractions and engage with the relevant information. Thus, there is some value to the lecture as a ‘special’ lived experience when students are forced to confront the information and ideas relevant to their educational programme. They can, of course, supplement this with own reading and learning, but students who don’t avail of the ‘special time’ of the lecture face an additional hurdle. On top of this, there are things that a lecture can do that cannot be easily replicated by textbooks and lecture notes and the like. First, they can effectively summarise the most up-to-date research and synthesise complex bodies of information. This is particularly true if you are lecturing on your research interests and you keep abreast of the latest research in a way that textbooks and other materials do not. Lectures can also translate complex ideas to particular audiences. If you are lecturing to a group (in person) you can get a good sense of whether they ‘grok’ the material being presented by constantly checking-in. This allows you to adjust the pace of presentation or the style of explanation to a manner that best suits the group. Another value of lectures is that they allow the lecturer to present themselves as an intellectual model to their students — to inspire them to engage with the world of ideas. Finally, if all else fails, lectures have value for the lecturer because they learn more about their field of study through the process of preparing for lectures. It is an oft-repeated truism that you don’t really know something until you have to explain it to someone else. Lectures give you the opportunity to do that several times a week. (i) Less is more: Lecturers have a tendency to overstuff their lectures with material, often because they have done a lot of reading on the topic and don’t want it to go to waste. What seems manageable to the lecturer is often too much for the students. I tend to think 3-5 main ideas per fifty-minute lecture is a good target. (ii) Coherency: The lecture should have some coherent structure. It should not be just one idea after another. Organising the lecture around one key argument, story, or research study is often an effective way to achieve coherency. I lecture in law or legal theory so I tend to organise lectures around legal rules and the exceptions to them, or policy arguments and the critiques of them. I’m not sure this is always effective. I think it might be better to organise lectures around stories. Fortunately, law is an abundant source of stories: every case that comes before the court is a story about someone’s life and how it was affected by a legal rule. 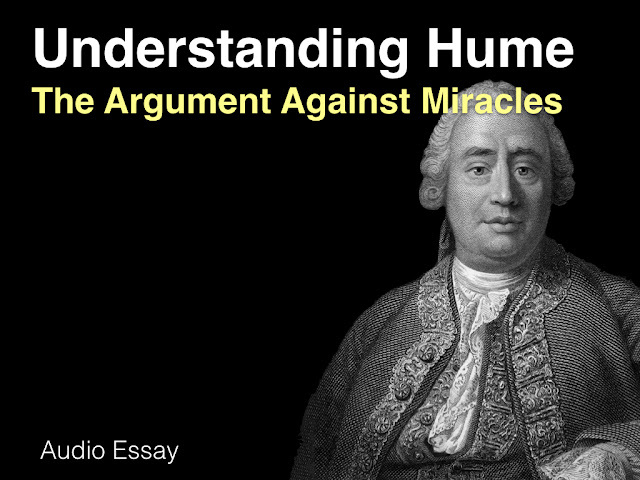 I’m starting to experiment with structuring my lectures around the more compelling of these stories. (iii) Variation: It’s always worth remembering that attention spans are short so you should build some variation into the lecture. Occasionally pausing for question breaks or group activities are good way to break up the monotony. 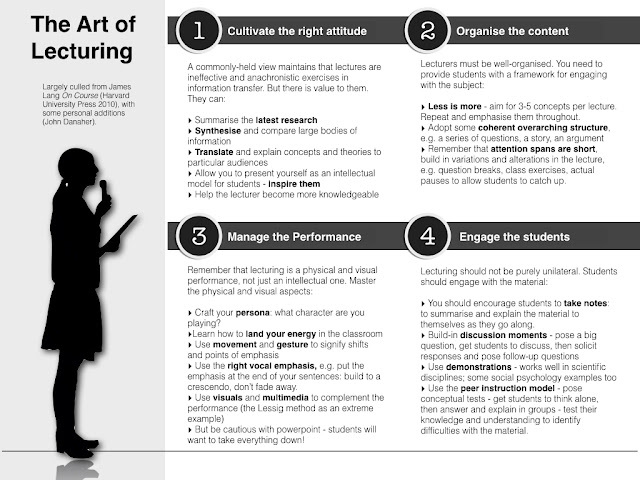 The third thing to do is to manage the physical performance of lecturing. This might be the most difficult part of lecturing when you are starting out. I know when I first started lecturing I never thought of lecturing as a performance art. But over time I have come to learn that it is. Being an effective lecturer is just as much about mastering the physical space of the lecture theatre as it is about knowing the material. I tended to focus on the latter when I was a beginner, now I tend to focus more on the former. The general things to keep in mind here are (i) your lecturing persona and (ii) the way in which you land your energy within the classroom. When you are lecturing you are, to at least some extent, playing a character. Who you are in the lecture theatre is different from who you are in the rest of your life. I know some lecturers craft an intimidating persona, eager to impress their students with their impressive learning and being dismissive of what they perceive to be silly questions. Such personas tend to stem from insecurity. At the same time, I know other lecturers who try to be incredibly friendly and open in their classroom personas, while oftentimes being more insular and closed in the rest of their worklife. I try to land somewhere in between these extremes with my lecturing persona. I don’t like being overly friendly, but I don’t like being intimidating either. ’Landing your energy’ refers to the way in which you direct your attention and gaze within the classroom. I remember one lecturer I had who used to land his energy on a clock at the back of the lecture theatre. At the start of every lecture he would open up his powerpoint presentation, gaze at the clock on the back wall of the lecture theatre, tilt his head to one side, and then start talking. Never once did he look at the expressions on his students faces. Suffice to say, this was not a very effective way to manage the physical space within the classroom. It wasn’t engaging. It didn’t make students feel like they were important to the performance. A good resource for managing the physical aspects of lecturing is this video from the Derek Bok Center on ‘The Act of Teaching’. The final thing to do is to make sure that lectures are not purely one-way. This is the biggest criticism of lectures and it can be avoided by building-in opportunities for genuine student engagement during the 50 or so minutes you have in the typical lecture. There are some standard methods for doing this. The most obvious is to encourage students to take notes. This might seem incredibly old-fashioned, but I always emphasise it to students in my courses. The note-taking process forces students to cognitively engage with what is being said and to translate it into a language that makes sense to them. To some extent, it doesn’t even matter if the students use the notes for revision purposes. Other things you can do include: building discussion moments into the class when you pause to ask questions, get students to think about them, and then ask follow up questions; using in-class demonstrations of key ideas and concepts; and using the peer-instruction model (pioneered by Erik Mazula) where you pose conceptual tests during the lecture and get students to answer in peer groups. Of these, my favourite are the first two. I like to pause during lectures to get students to think about some question for a minute; get them to discuss it with the person sitting next to them for another minute; and then to develop this into a classroom discussion. I find this to be the most effective technique for stimulating classroom discussion — much more so than simply posing a question to the group as a whole. Demonstrations can also work well, but only for particular subjects or ideas. I use game theory in some of my classes and I find demonstrating how certain legal, political and commercial ‘games’ work, using volunteers from the class, is an effective way to facilitate student engagement.